20 minutes walk distance to Peradays. Beautiful area to see and also if you can catch a BJK match while you are visiting it is the best way to blend in to Turkish people and football culture in Turkey. Opening its doors to publicon 3 November 1947, the İnönü Stadium, which would eventually be replaced bythe Vodafone Park, had been a symbol of Beşiktaş JK’s glorious years and ahome to numerous Beşiktaş JK legends such as Süleyman Seba, Hakkı Yeten (BabaHakkı), Sanlı Sarıalioğlu, Rasim Kara, Rıza Çalımbay as well as the unforgettablescoring trio of Metin-Ali-Feyyaz. At the end of the 2012/13season, Beşiktaş JK Management led by the Chairman Fikret Orman tore down theInönü Stadium and started building the Vodafone Park on its place, using the Club’s own means. After 1065 days, Turkey’s oneand only smart stadium was completed and held its first game on 11 April 2016when Beşiktaş hosted Bursaspor in a Turkish Super League action. The official inauguration ofthe Black Eagle’s new shrine took place on 10 April 2016 and attended by the PresidentRecep Tayyip Erdoğan, Prime Minister Ahmet Davutoğlu, the Turkish Staterepresentatives, politicians, Beşiktaş JK Chairman Fikret Orman and the membersof the Beşiktaş JK Council and Executive Board. To help the fans experiencea day to remember, Vodafone has equipped the new stadium with rich-contentdigital displays, which are commonly found in many modern stadiums today, alongwith broadband mobile and wireless networks. Different sized interactive HDscreens installed all over the stadium are going to broadcast fan interviews,on-going promotions, game statistics and live scores from other matches on anon-stop basis. The WiFi service will ensure that smart phones can access thelatest game information easily and without delay. In addition to being hometo Beşiktaş, the 42.000 seater, multi-purpose Vodafone Park is designed tofunction as an entertainment and fashion center. Throughout the year, it willhost numerous concerts and fashion shows by famous artists and designers. Inthe meantime, the high-class restaurants, Beşiktaş JK Museum, Beşiktaş Shop andVodafone Mobile Center located inside the stadium will offer top qualityservice to their visitors and customers at all times. 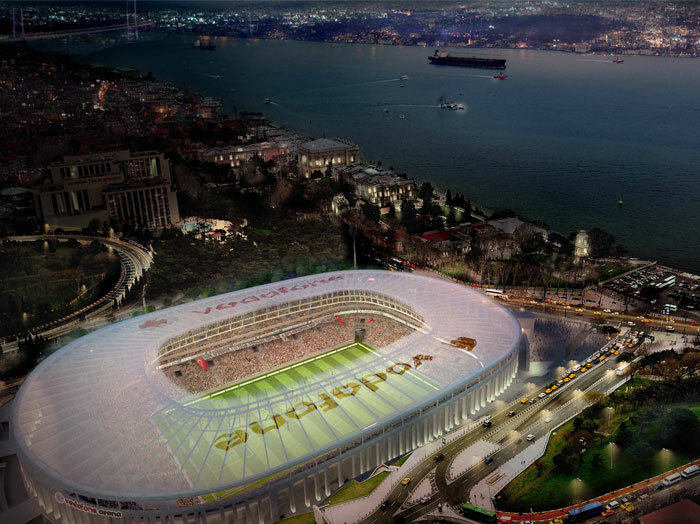 In short, Beşiktaş JK’snew stadium Vodafone Park is going to be a hub of city activity not onlyduring match days but on everyday of the year.